Seventeen-year-old Caymen Meyers studies the rich like her own personal science experiment, and after years of observation, she’s pretty sure they’re only good for one thing—spending money on useless stuff, like the porcelain dolls in her mother’s shop. I’ve been wanting to read Kasie West her books for ages and I finally did! (At least, one of them). The story started off with Caymen being in her shop, a doll shop, which she owns with her mother. Right from the start, we meet Xander, and we learn that he’s going to be a character that’s going to play a big roll in this story. So, Caymen and her mom are basically broke. They need to do what it takes to keep themselves from drowning, and I could totally feel for them. I know what’s it’s like to not have that much money and I was so into the story, I wish I could help them in some way. I also think it was really great that Kasie put this motive into the story, so we all get to see how a life being poor looks like. I adored Caymen because she wasn’t the basic typical contemporary girl – she actually was kind of different with a different clothing style and a different personality. I really liked it that she was very sarcastic – which made me laugh hard at times. Her comments are really super hilarious. Caymen and Skye literally have the best friendship ever. Normally in a contemporary, there are also some obstacles when it comes to friendship, but in The Distance Between Us, everything was great between Caymen and Skye, and I enjoyed that. Xander was also a character I really adored. He was rich, of course, but he wasn’t arrogant like most rich people. He was just really down-to-earth and literally wanted to do all kinds of things for Caymen, which was very cute! The relationship between Caymen and Xander moved gradually and I prefer that. It’s great that Kasie didn’t rush them into being with each other. The Distance Between Us was a really cute read and there wasn’t actually anything that I didn’t like. 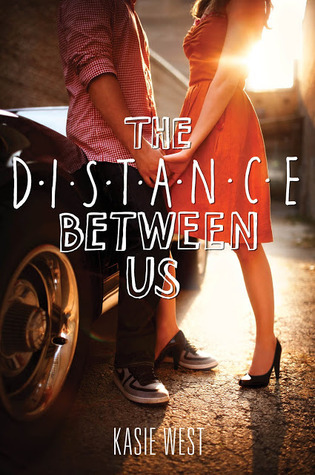 So, if you’re looking for a cute contemporary read: The Distance Between Us is definitely the one you should be reading. Enter your email to follow this blog and receive notifications for new blogposts.